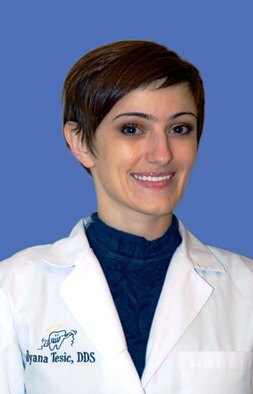 Dr. Bilyana Tesic graduated from Loma Linda University School of Dentistry in 2009. Prior to dental school, she earned Bachelors in Physiology from San Jose State University. She is passionate about dispelling patient's fear of dentist, delivering comprehensive dentistry and educating patients about health and wellbeing as means of prevention. She believes in giving back to the community, whether it's going on mission trips to Mexico and Ecuador to provide dental care to populations who have never received it, or volunteering dental services to local Remote Area Medical (RAM) organization. In order to deliver the best care, she keeps up with latest technological and procedural advances by attending various professional seminars and conferences, as well as continuing education courses. Dr Tesic is an active member of American Dental Association, California Dental Association and Monterey Dental Society. In her spare time, she enjoys practicing yoga, hiking, traveling and exploring French cuisine.